Tomorrow at the historic Andrew Freedman Home, our culinary ambassador and New York Emmy Winner, Baron Ambrosia, will premier his movie, ‘The Baron Is Dead’ along with a concert by the legendary Grand Master Mele Mel. 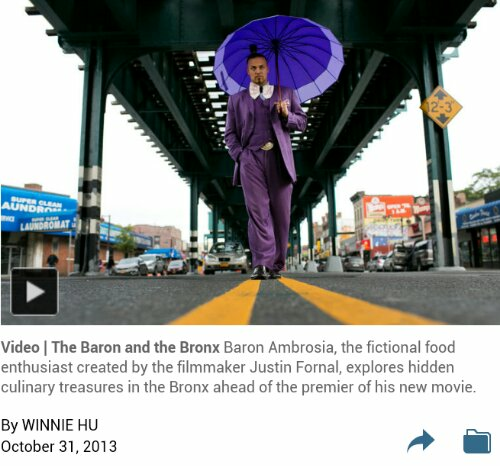 Many of you know the Baron from his Bronx Flavor show on BronxNet which takes the viewer on the many gastronomical delights the Bronx has to offer. His zany antics makes the show far more entertaining than anything you’ll encounter on the Food Network. His shows eventually caught the eyes of the Cooking Channel where Baron Ambrosia continues to take us on his incredible journeys. You may also remember that this past he was the first person to swim the entire length of the Bronx River and several years ago on a cold, winter’s night, we broke bread at the Old Bronx Courthouse and feasted upon beaver, possum, squirrel, racoon, fisher and yes, ants, silkworms and water bugs. I couldn’t eat the water bugs but the racoon was divine. 9:45 PM Grandmaster Mele Mel Concert Outdoor Event. Dress Warm. Bring blankets & beach chairs. Families welcome. Hope you are as excited about tomorrow night as I am! See you there! Check out Baron Ambrosia’s website for some of his other projects.